Back last fall, one of the most exciting anime announcements was a declared sequel to the incredibly popular show Nisekoi, which centers around the heir to the Japanese Yakuza (Raku) and his search for love despite being locked into a ‘false’ relationship with another gang’s heiress. At the time of the announcement, most everyone seemed to be pretty enthused for a second season, myself included. 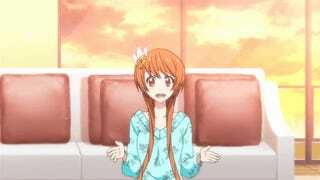 However, after the initial shock subsided, a different, more negative feeling began to resonate around the community for one primary reason: the manga that the anime was supposed to adapt (also called Nisekoi... I know, right?) had supposedly been dragged out, with little actual progress being made. Surely, this meant that the anime would be same, right? This line of reasoning actually had many viewers walking into the second season’s spring premiere with a negative outlook, and I really feel like to a certain extent we’ve all been missing the point. Of course, I’m not trying to deny it: the initial predictions were absolutely right. Nisekoi: has made very little progress in its story thus far, and is very unlikely to do so during its expected twelve episode run. Some frustrated fans blame the manga’s popularity, and they’re right! Nisekoi is extremely popular, and likely makes quite a bit of money! Of course something like that would be dragged out, from a financial point it just plain makes sense that if something makes money, more of that something would stand to benefit the publisher. But isn’t that the point of all media? In the end, properties that make more money tend to last longer, and it’s important to understand that this is not inherently bad, provided the quality of the property doesn’t get devalued by the extension. So what about Nisekoi? Is its entertainment devalued because it continues? I would argue that this is not the case, because fans of the first season will find that the second season has exactly what they are looking for: more Nisekoi. The comedic moments are just as prevalent, the same type of humor is still amusing, and while many of the characters fall under common rom-com archetypes, the character interactions are handled well (or, for the sake of argument, at least as well as the original season) and serve the purpose the writers intended. The problem according to a few people is that the actual romance never progresses, and none of the girls seem to ever get paired off with the protagonist, Raku. They’re absolutely right, because to do that would be to end the series. The entire plot centers around the ‘will they, won’t they’ situation Raku is in with all of the romantic interests in the show, and to resolve this would be to resolve the general conflict and thus conclude the series. For the publisher, this means less money, and for fans, this means no more enjoyable comedic Nisekoi. The lack of ending hardly phases me, because I don’t want it to end! Nisekoi is an amusing show, and while I do want it to end on a conclusive note, I don’t really want it to end at all because it’s entertaining. The second season has continued to be every bit as funny as the first season for me, and I feel like the primary reason that people aren’t enjoying it is because instead of being interested in the journey, they are too focused on the end and what may or may not come to be. Of course, I can hardly recommend the show for those that are firmly insistent on reaching a full conclusion in the anime, because it seems very unlikely to happen. However, if you do enjoy rom-coms or have enjoyed the first season, then do yourself a favor and enjoy the second one for what it is: an amusing, unserious romantic comedy. It may not be conclusive, and it may like to ‘trick’ viewers into thinking it will go one way or the other, but in the end, it is still Nisekoi. 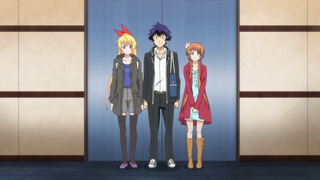 Nisekoi: is currently available for free and legal streaming on Crunchyroll, with a new episode every Friday.